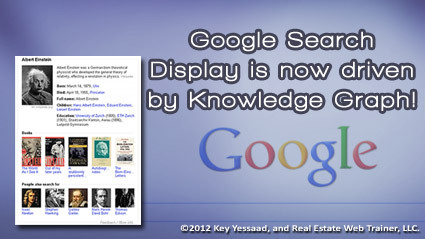 Google Search Results have been updated and the display has been simplified; Google has been pushing an important initiative called ‘The Knowledge Graph’ in order to include important Search Results that are Scientific, Historic, Geographic, Biographic, etc… Let’s Google ‘Albert Einstein,’ you will notice the normal list of websites on the left, and to the right a panel with a short Bio, Books on Einstein, and related people search results; you can even give Google feedback about the information if you think something is wrong. Further, if you click on a picture of one of the related scientists, say Sir Isaac Newton, you will be presented with a ribbon of scientists and thinkers related to your knowledge graph so you can dig deeper in your understanding of your scientific or biographical search. The other cosmetics changes in the search display are the search tools have been collapsed from being on a column to the left of the list of search results, and moved above horizontally under one link, which cleans up the display of results.